People with ambition often join forces to expand -- Lenin and Trotsky teaming up paved the way for the Soviet Union, and we don't have to tell you how awesome that worked out for everybody. Growing empires sans the buzz-killing communism, The Cedar Hotel. A combined venture from the owners of Manor and the Fifty/50, TCH unites the two spaces formerly occupied by Cactus and Melvin B's in the historic Cedar Hotel building to form a raucous lodge-esque bar featuring an interior appropriately covered in cedar planks surrounding plush, leather barstools that are buttery in appearance, but totally taste like margarine. 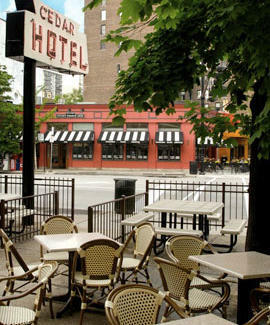 Despite the nice'd up inside, the star of this show, as it had always been with the two before, is the sidewalk patio, now united into a single 150-plus-seat alfresco behemoth scattered with wicker chairs and leafy trees to keep things shady, a role you relished as Sigma Chi's social chair. To start, food is limited to pub fare like burgers, ahi tuna with avocado and pulled pork sliders, but eventually they'll be rolling out in full force with a favorite or two from the Fifty/50 (Triple-Bacon BBBLT) plus seafood specialties like lobster cocktail and oysters on the halfshell, who're just a little too gross to be Ninjas. Specialty cocktails like No Tell Hotel Lemonade (SKYY Passion Fruit, homemade lemonade) and the Stoli O/Triple Sec/7UP/Fresh OJ Bell Hop Orange Crush can be had in 24oz keeper cups, helping you implement your own brand of socialism, the one where you actually speak to women.